There is no single definition of the term "runaway youth" or "homeless youth". However, both groups of youth share the risk of not having adequate shelter and other provisions, and may engage in harmful behaviours while away from a permanent home. The precise number of homeless and runaway youth is unknown due to their residential mobility and overlap among the populations. Determining the number of these youth is further complicated by the lack of a standardised methodology for counting the population and inconsistent definitions of what it means to be homeless or a runaway. Estimates of the homeless youth exceed one million. Thus homelessness among adolescents and young adults is a major social concern in the United States. 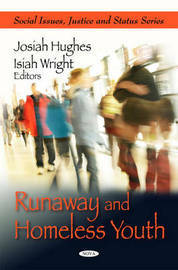 In this book, the authors cite research indicating that youth may be the single age group most at risk of becoming homeless, yet comparatively little research has been done in the past decade on this vulnerable population. After reviewing the characteristics of homeless youth, the authors review recent research findings on the homeless youth population and interventions developed to address their housing and service needs. These include interventions directed at youth themselves (education, employment, social skills training) as well as family-focused strategies. The authors conclude with future directions for both research and practice. This book consists of public documents which have been located, gathered, combined, reformatted, and enhanced with a subject index, selectively edited and bound to provide easy access.